Hi everyone! Thanks so much for visiting our blog. As we prepare for this medical trip to Ethiopia, we are so excited that you are able to share this experience with us. My name is Annie Lu; I was born in Taipei, Taiwan and moved to the US when I was very young. I grew up in Arlington, Texas and completed my undergraduate degree in Finance at Texas A&M University (whoop!). For a few years, I worked in a neuroscience lab at A&M, and though the experience was an amazing opportunity, I realized research was not in my future. During the summer before medical school, I went overseas to Asia on a mission trip. This was an life-changing experience for me. Not only did I get to share God's gift with college students from another country, but He was also able to show me how mightily he can move and how much we need Him in our daily lives. Now, I am extremely blessed to begin my first year in medical school in San Antonio! Although studying for classes can feel like torture, the best part of it has been getting through each day with God's strength. Because of Him, I have been able to meet the most caring friends at school, find a good fellowship and church, and have started to really enjoy my life as a medical student. Most importantly, I am constantly reminded of the main reason why I came to medical school - and that is to serve others. This is why I am excited to travel to Ethiopia this summer to help one of the most insufficient and lacking health care systems in the world. I believe that all of us are here because of a specific purpose. Once we find that purpose, we should pursue it as hard and as passionately as we can. 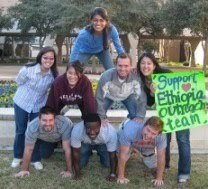 Our team is passionate about improving lives of our future patients, and for this summer, it will be the patients we will see in Ethiopia. We thank you for spending the time to get to know our team better and for any help you are able to provide. Then the righteous will answer him, saying, ‘Lord, when did we see you hungry and feed you, or thirsty and give you drink? And when did we see you a stranger and welcome you, or naked and clothe you? And when did we see you sick or in prison and visit you?’ And the King will answer them, ‘Truly, I say to you, as you did it to one of the least of these my brothers, you did it to me.’ "